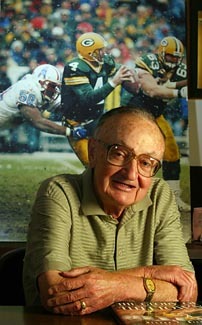 Green Bay Packers team photographer Vern Biever photographed at his office at Biever travel in Port Washington, Wisconsin. PORT WASHINGTON, WISCONSIN-In the words of legendary Green Bay Packer quarterback Bart Starr, "I know of very few non-players who have made greater contributions to the Packers' rich history and tradition than Vern Biever." That glowing comment is from a July 2001 letter Starr wrote to the Green Bay Packer Hall of Fame selection committee and is one of several letters and calls that Starr has made over the years convincing them to induct Biever, into the Hall of Fame. Starr's wish comes true on July 13 when Biever will join the Hall of Fame along with player Sterling Sharpe. Starr will introduce Biever at the ceremony. 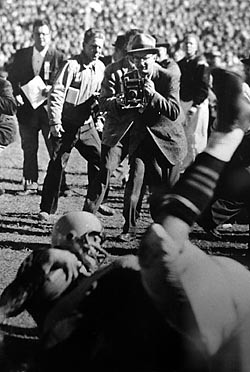 Biever, who has more first place winners in the NFL Hall of Fame photo contest than any other photographer, covered his first Packers' game in 1941 while a student at St. Norbert College in DePere, Wis. near Green Bay. Biever was in the Port Washington High School camera club, so when he started college he called the editor of the Milwaukee Sentinel and asked to cover the Green Bay Packers. The next week he was assigned to cover a game and after the final gun, put the film on a train to Milwaukee. He continued to photograph the Packers for the next year and a half until he enlisted in the army during World War II. While in the army he remained a photographer working for the 100th infantry newspaper in France and Germany. On his returned to his hometown of Port Washington after the war, the Milwaukee Sentinel had started sending its own photographer to cover the Packers games. Determined to continue photographing the Packers Biever went to the team and offered to shoot the games for them for free. "I guess the price was right", he says because the Packers agreed to give him a credential. 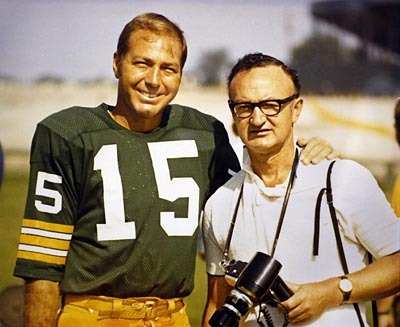 Green Bay Packers team photographer Vern Biever photographed in the 60's with quarterback Bart Starr. As the team photographer Biever witnessed some of the most exciting times in NFL and Green Bay Packers history, the Vince Lombardi era. He covered the Packers' five NFL Championships, including the first Super Bowl in Los Angeles in 1967. One of Biever's favorite memories was from that Super Bowl that proved, according to Biever, " that the NFC players were better football players." Biever also covered the Packer's 1968 Super Bowl against Oakland in Miami. He went on to cover 33 more Super Bowls, in fact, he and his son John Biever, a longtime Sports Illustrated photographer, are two of only six photographers that covered the first 35 Super Bowls. But at age 78, Vern decided to skip the 2002 Super Bowl in New Orleans. "Equipment has gotten heavier and with the extra security and long lines I thought that was a little too much for an old guy." he says. He has seen the Super Bowl sidelines go from a handful of photographers to the hundreds covering the game this year. Vern started bringing John, and, later, his younger brother Jim, to Packers games when John was a freshman in high school. It was in high school that John shot his famous picture of a Packers touchdown during the "Ice Bowl", a nickname for the 1966 NFC Championship played in thirteen degrees below zero weather. Green Bay Packers team photographer Vern Biever on the sidelines at a game at City Stadium in Green Bay, a high school stadium where the Packers played before 1957. In 1968, besides working as the Packers team photographer, Vern started shooting pictures for Pro Football Weekly and would also make yearly trips to New York to sell pictures to Sports Illustrated, Newsweek, Time and Random House. It was a hectic schedule, especially when the Packers were on the road. Those days he would return to Green Bay late, around 10 pm, then drive about 1 1/2 hours to Port Washington and spend the night in the darkroom to have prints ready to be picked up by 6 am. At the time Biever was also running a Ben Franklin store in Port Washington. His father would help by opening the store in the morning. He owned the store from 1948 until1988 when he sold it. He also started Biever Travel in the same building in the mid-70's which he still owns today. In the 70's Biever took on additional photographic duties as the team photographer for the Milwaukee Bucks for several years. "And those were the good days," he says, covering the likes of Wilt Chamberlain, Kareem Abdul Jabbar, Bill Bradley and Jerry West. In 1997 Biever published a book "The Glory of Titletown: The Classic Green Bay Packers Photography of Vernon Biever." The first two printings have sold out and he's hoping there will be a third. He and son John will also have photographs in another book coming out this fall, written by Bud Lea, called "Magnificent Seven" about the championship games that Vince Lombardi won. Biever does not seem to be deterred by the sometime icy conditions at Lambeau Field and City Stadium, a high school stadium where the Packers. He vividly remembers the Packers' 1966 championship game, The Ice Bowl. "Nobody expected in the morning to have that kind of temperature", Biever says, "Thank God that we were photographers and we were able to move around. There were also heaters on the sidelines where we could warm up." 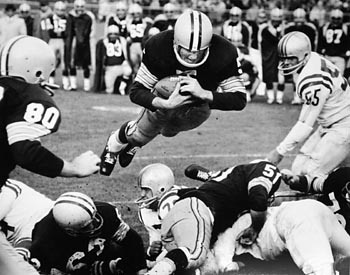 Green Bay Packer Paul Hornung dives into the endzone for a touchdown during the Lombardi era. The bad part was changing the film. " In those temperatures the film leader could break off and the photographer wouldn't know it until he rewound it thinking he had shot a whole roll." Biever said. Photographers would try to keep one camera under their jacket to keep it from freezing. The Packers had a system of electrical wires that ran underneath the field to keep it soft, but it wasn't working properly the day of the Ice Bowl. "It was pretty slippery out there", he adds. "In the early years you would hope there were more photographers to break the (icy) wind." As a pioneer of football photography Biever has seen a lot of changes in the NFL, including the advent of television coverage. He was not happy about sideline photographers being moved behind television cameramen, "but, of course, they're (TV) paying the freight." He offers these words of wisdom to beginning football photographers; "It pays to know the game. You know what to expect in certain situations." Also as a team photographer it was important to get to know the players and gain their trust. He would never publish a picture of a Packers player in an unflattering light. " I only show players in a good light, unless, of course, it's an opposing ball player." 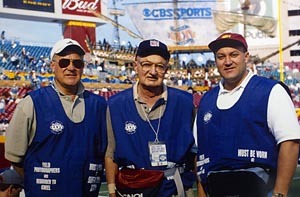 Green Bay Packers team photographer Vern Biever, middle, with his sons John, left, and Jim at Superbowl 35. For now Biever says he will continue as the Packers' team photographer as long as he is able. The biggest rewards of the position he says have been getting to know the players and coaches. He refers to Bart Starr, former Packer assistant and now 49er head coach Steve Mariucci and Brett Favre as some of his closest friends. In a congratulatory letter Starr wrote Biever in Sept. 2001 it's apparent that the players and coaches feel the same way about him: "CONGRATULATIONS ... Cherry and I are thrilled for you and your family and are literally choked up with emotion ... We look forward to attending the induction ceremonies next July 13th when the uniquely special Green Bay Packers Hall of Fame opens its doors to a UNIQUELY SPECIAL GENTLEMAN."